Cleomes may not be the most popular annuals sold at home improvement stores and nurseries, and it may be because they look rather weedy as young seedlings in six-packs. Unlike pert marigolds or dazzling New Guinea impatiens, cleomes usually do not start blooming until they are well established in the garden. Once the flower clusters emerge, you will see why gardeners add this to their list of easy-care favorites. Many petals radiate from a central point, forming a cluster, which tends to be softball-sized. Long stamens give flowers a spiky look. Even the foliage is attractive as it is fern-like and delicate. Cleome flowers are easy to start in the garden from seed. Perhaps too easy, as the plants can self-seed to the point of being a nuisance. The seeds need light to germinate, so you can just sprinkle them in the garden after the danger of frost is past, and look for seedlings after 10 days. Alternatively, sow them in the autumn, and they will germinate when conditions are just right in your the following growing season. If you do allow the plants to self-seed, thin the newly emerging seedlings to allow at least 18 inches between plants. This improves the vigor of individual plants, encouraging the most blossoms from each plant. If you want to limit cleome’s self-seeding habit, spend time each week plucking the long seed pods that form under the flowers throughout the season. Cleome flowers grow best in full sun, as shady conditions can make them grow so tall as to topple over. If you start with transplants, you will see blossoms from early summer until the first frost. Gardeners growing cleome flowers from seed usually see their first flowers in mid to late June, depending on the climate. Cleomes do best in average garden soil or rich well-drained garden loam. Once started, it takes care of itself. What is more, the upright plants need no staking. This plant shrugs off flower insect pests and diseases. Once established, cleomes are drought tolerant, making them a welcome addition to the xeriscape garden. Add a 3-inch layer of organic mulch to their planting bed, and you will decrease its water needs even further. For successful germination, cleomes need higher than normal temperatures. Fluctuating day/night temperatures are essential for optimum germination. Days, the temperatures should range from 80 F to 85 degrees Fahrenheit, and night from 68 to 70 degrees. The humidity should be from 90 to 100 percent. As it grows, the temperatures can be lower at from 75 F to 80 degrees Fahrenheit during the day and 60 to 65 degrees at night. Cleomes are not frost tolerant. If using good well-drained soil and mulch, no fertilizer is necessary. To grow cleomes from seeds, cultivate the bed where the spider flower grows as deeply as possible, break up the clumps, and rake smooth. Then take a hoe, and dig small holes 4 feet apart in all directions. If planting in rows, alternate the holes so that those of the second row fall in between those of the first row. Drop about six seeds into each hole and cover with a quarter inch of soil. Plant the seeds as early as the ground can be worked in spring. Plant directly outdoors, no cold frame is necessary. Do not worry about frost. The seeds will germinate only after the weather warms. Should the ground freeze again after planting, no harm will be done. Many gardeners plant their cleome seeds in late fall in the beds where they are to grow, eliminating that part of spring work. However, when planting seed directly out in the landscape garden wait until the last danger of frost passes before sowing seed. 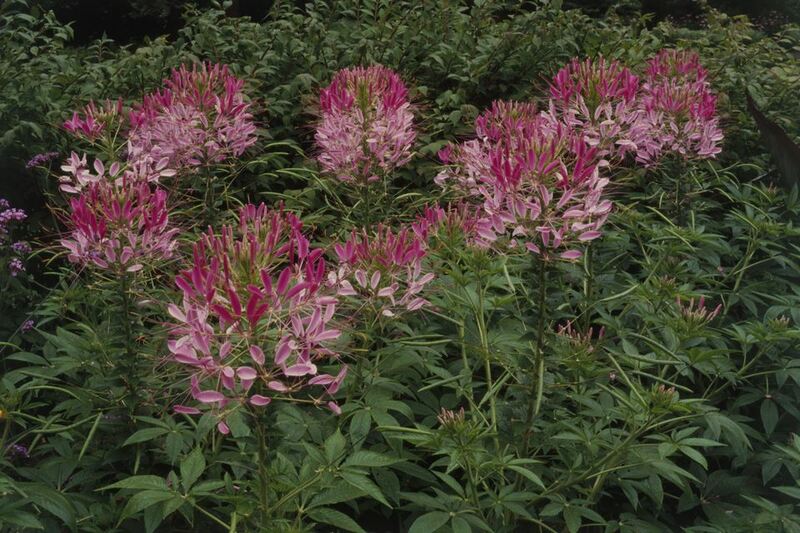 You can grow cleome in large containers, but choose a compact variety like the sparkler series for best results. Combine your potted cleomes with a mounding flower like vincas and a trailing flower like petunias for the most full and lush look. Cleome flowers are excellent candidates for the back of the flower border, where their lanky stems can hide behind other plants, but their festive flower clusters can sway in the breeze above other flowering annuals. Plant cleomes in clusters of five plants or more to avoid the "soldiers-in-a-row" visual that single plants suggest. The casual form of cleomes suits the cottage garden or naturalized meadow well. Mix cleomes with zinnias, cosmos flowers, black-eyed Susans, salvia, or celosia. These plants all thrive in the same sunny conditions and moderate irrigation that cleomes love.